James R: Following a barren week for me last new comic book day, I'm pleased that this week sees things returning to normal for my pull-list. In keeping with the Tom King-lead renaissance, I'll be picking up the latest issue of Batman, but I'm even more interested to pick up the Swamp Thing Winter Special that's finally released this Wednesday. 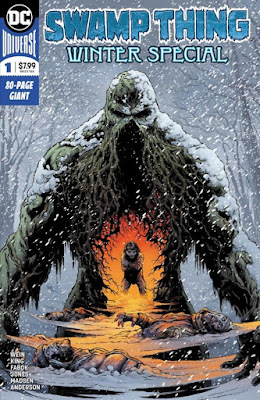 With a script from King, and art from Jason Fabok, the issue is a tribute to Swamp Thing creators Bernie Wrightson and Len Wein, and from what I've seen of the book, this has the makings of something special. The next chapter of Batman: White Knight, Sean Phillips' visually beautiful Dark Knight tale, joins Mister Miracle in running to multiple reprints - looks like the secret to a running a successful comics company is to give talented creators the chance to do innovative work...who knew?! The other issue of note on my pull is VS from Image. This science fiction tale comes with a script from Ivan Brandon, but what's sold me is that Esad Ribic is on art duties. Ribic is one of those artists whose work is so good, I'd be interested in seeing it even if it was a My Little Pony tale (okay, maybe that's a step too far, but you get the idea). Andy H: A bit out of the blue, for me anyway, as Koshchei The Deathless #2 is my pick of the week. I don't normally do Hellboy but something drew me to issue #1 and I thoroughly enjoyed it. Koshchie was originally sent to kill Hellboy by the witch Baba Yaga but things turned out differently. Now in a pub in Hell, Koshchie relates his life story to Hellboy. Ben Stenbeck's art has a Mignola-esque quality to it and the story itself, by Mike Mignola, is engrossing. New kid on the block this week is VS #1 from Image. Hands up straight away, it's the art that caught my attention first as it's by Esad Ribic. Basically, it's gorgeous. Ribic teams up with writer Ivan Brandon to explore a world where war is now a spectator sport. New, but with a returning character in the lead role, is X-Men Red #1. So, Jean Grey is back (read Phoenix Resurrection) and she gets to have her own X-team. Do we need another team? Well, the arguments will continue to rage on, but I have missed Jean so I'll certainly be hanging on for the first arc at least. For something a little bit different there's Legenderry: Red Sonja #1. This isn't your regular Sonja, this is a steampunk version and probably worth picking up for the beautiful cover by Joe Benitez. Batman: White Knight #5 will continue to captivate me with the art of Sean Murphy and Giant Days #35 will captivate me just because it is so awesome.